This impossibly tiny, 100 square foot house contains tiny chairs, a tiny fireplace, and a tiny loft with a tiny window which serves as a tiny bedroom. But of course its owner couldn't help springing for the 15" MacBook. 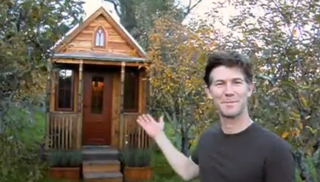 Jay Shafer is the ingenuous architect and unfortunate resident of this tiny house, one of many he has built as part of his Tumbleweed Tiny House Company. He's been living in the above house since 1997—this tiny tour was filmed in 2007—but he's still actively building new postage stamp mansions today. I call the first of my little hand built houses Tumbleweed. My decision to inhabit just 89 square feet arose from some concerns I had about the impact a larger house would have on the environment, and because I do not want to maintain a lot of unused or unusable space. My houses have met all of my domestic needs without demanding much in return. The simple, slower lifestyle my homes have afforded is a luxury for which I am continually grateful.